Happy Monday! How do you like my new statement necklace? It is from Happiness Boutique, an online store based in Germany, I recently came across. I was asked to pick one of their gorgeous statement jewelry to review and here my choice: this charming vintage inspired floral necklace, that caught my eye for the sophisticated and eye-catching design. It looks so precious and classy; despite the heavy style, it is very versatile and easy to match, adding that particular final touch to every outfit and making it more special, as you can see from my simple look of the day. But the site got many other unique items, clothing included, with worldwide free shipping without minimum purchase; plus it offers a special customer reward program. Wish you a good start into the week, it's the last one of July, let's make it fab! Yesterday I was thinking about you, I payed a visit on your blog and I've noticed that you haven't post for a while... So glad to see you now! The first time when I heard about Happiness Boutique was from Mihaela Pojogu' blog (About women and not only). I see that they have beautiful products! I saw on your gorgeous necklace page photos with other persons wearing it - that's very helpful for the customers! I like your asimetrical pink dress, it's so beautiful! The entire look it's chic! Glamour accesories to brighten up a casual look it's trendy! I am addicted to their gorgeous collection! They have so many things, you don't know which one to pick first. Hope you are had a lovely weekend, take care my doll! Sei molto bella con quest'abito. Le creazioni di Happiness Boutique sono tutte belle e di gran fascino. Mi piacciono molto. Che spettacolo questa collana e poi a te illumina tantisismo il volto, ora vado proprio a fare un giro sul sito! Che amore questo vestito Lili. l vestito è delizioso, sia nel modello che nel colore, ma i tuoi accessori sono strepitosi, perfetti... sembri una bambola!!! They have for sure one of the greatest program, glad to see you featuring them. I like your necklace, so many beautiful items I wasn't able to choose so I have earrings, if you remember. Nice look honey, perfect for summer! That necklace is gorgeous Lilli! Sounds like a great store and I will have to check it out! You look gorgeous in pink and I am loving the cute sandals. adoro ogni singolo dettaglio. davvero, sei bellissima! Hi Lilli, love your summer dress and floral necklace. So pretty. Enjoy your summer holiday! Ciao Lilli. Questa collana è molto carina e a me piace molto anche il resto del look. Dovrò dare anch'io una sbirciatina sul sito. What a wonderful fantastic little Bag! Questa collana è uno spettacolo, molto bello anche il vestito, un tono di colore che mi piace molto! I enjoyed working with them also. Their statement necklaces are so pretty! What a stunner Lilli! It looks so pretty with your pink dress. And i like your pink dress and your shoes,too!! So elegant style! !Have a happy week dear!Hugs!! You picked a gorgeous necklace Lilli! It's definitely a statement and I really like its glamorous vintage styling. Have a lovely week my dear! ciao Lilli, carinissima la collana che hai scelto! :) mi piace molto come hai abbinato il vestito rosa e le scarpe sono deliziose! Adoro il colore rosa acceso del tuo abitino, che tra l'altro è perfetto con la tua abbronzatura. La collana poi non ne parliamo proprio...è meravigliosa! I really love this shade of pink Lilli. What a dashing look. You look amazing dear, and I love the necklace as well, great choice ... I think we picked the same style, hehe. partiamo dai capelli raccolti, stai benissimo ! adoro. il vestitino rosa è una delizia e lo porti molto bene , poi accostato a quegli splendidi accessori lo rendono ancora più speciale. adoro il tuo vestito, e adoro il modo con cui hai abbinato tutti gli accessori!!! complimenti sei bellissima!!! stai benissimo, adoro queste collane, deliziosa la pochette! The necklace surely looks precious! 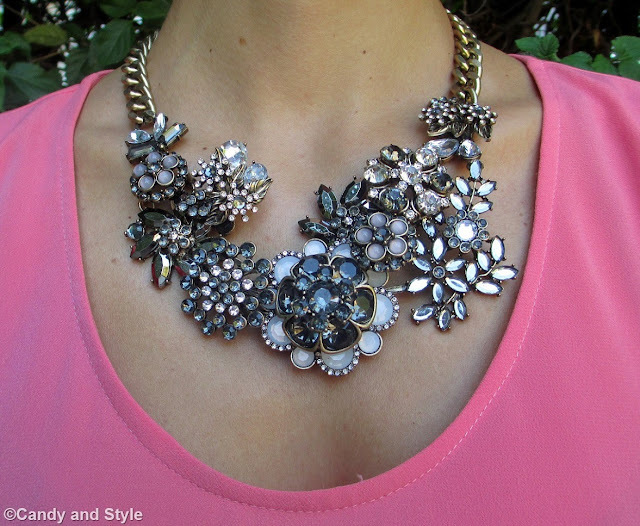 I have always loved big statement necklaces that spice up any outfit! And how cute you look in that beautiful pink dress? It surely looks very lovely on you & I love the high-low effect it has! Ce l'ho anche io identica questa collana Lilli, è troppo bella! E poi quanto ti sta bene il rosa? Mi piaci troppo con questo abitino! Gorgeous! You look lovely Lilli! kisses! Have a great week!!! Bello tutto il look ma la collana Lilly è veramente splendida. ti sta bennissimo il vestito rosa. You look pretty and cute in this pink dress. Very lovely and the Statement necklace make the Look very Special. Great choise! I need such a fantastic necklace too in my jewellery selection. I also love the black sandals. dolcissimo questo outfit...che bambola sei! Meravigliosa con questo abito Lilli! Un bacio. I love this kind of necklaces that bring personality to any look, I think we saved time thinking about sophisticated combinations! You chose a very nice model made I will visit this shop because it is the first time I hear it, Lilli good start to the week! ...splendido look...adoro il rosa ed i vestitini...e questo è carinissimo...bella anche la collana!!! Quella collana è fantastica! E anche le scarpe! Lilli come ti sta bene questo colore. In questi giorni sei più radiante che mai, ti vedo anche su instagram. La collana poi è davvero il giusto tocco e conoscevo anche io questa marca. Mi raccomando continua sempre così tesorina. Romantica come non mai Lilli, quanto sei dolce in rosa!! !